Happy Happy Wednesday to everyone. I know last week I said I would try to post more, but time just got away from me and here I am a week later, finally getting to post. Before I get to everything I am knitting and everything I started.....There is a new really cool pattern out there called Merge....I know this is in my near future....now I just need to find the right colors to make it with! I did not want to steal the picture from the designer...so please click the word "Merge" and it will take you to the pictures! This past weekend I went to Jaime's niece's graduation....it was nice. I took my Viajante to knit on. The coliseum we were in was pretty cold and we had a vent right above us....so as I knit on Viajante, Jaime put the already knitted part on his legs (he was wearing shorts), so the knitting came in really handy! I am a little behind on the Viajante. I realized that today is the deadline for the Knit Purl Hunter KAL where we made Ridgely, so I needed to get my knitting needles a going on that to get it finished....which pushed off some of my Viajante knitting. I would need to knit 19.5 grams tonight to get all caught up (which will probably not happen) but I am hoping to catch up this weekend....maybe even start the lace part). Here it is so far. Now to the Ridgley I neeeded to get done......well, I knit till 11:45 pm (which is SUPER LATE FOR ME) and I finished....I let it block over night. I also started the fingerless mitts KAL that I am doing for my LYS (Inskein Yarns)......I changed up the cast on. The pattern says to cast on, knit 4 rows, then do a row of k2tog, yo, then knit 4 more rows (same thing at the end of glove)...Once glove is done, you fold the knitting at the k2tog, yo row and seam it to form the picot edging. Well, for the start, I decided to do a provisional cast on (video here), knit 4 rows, knit the k2tog, yo row, knit 3 rows, and on the 4th row, I took one stitch from the 4th row, and one from the provisional cast on and did a k2tog all around so the picot edging is already done. Now, for the bind off, I will do it the way the pattern states. But this is just one less thing to seam up. Here is the very start of each....not much, but at least started! I also started one more new project....Yes, I know I am crazy, but I just could not help it. One of my BFF's (Darlene) texted me on Saturday stating she wanted to knit a certain shawl. It is Jared Flood's Leaves of Grass Shawl....it takes 1375 yards. She did a lot of research on the pattern (sometimes she picks some doosey patterns that are really hard) and a lot of the notes said it was a pretty easy shawl except for the cast one. It calls for a circular cast one. I have never done one, but I think I did pretty good (I did have to re-start a couple of times). Darlene had bought me some beautiful Wollmeise Lace yarn in colorway Wasabi last year and I have been dying to make something with it....well, now I have the perfect pattern for it. Here is the start of it (it will sit on back burner till Viajante is done....but I had to get it started)....Darlene is also knitting this pattern in her Wollmeise Lace in colorway Lila Ludmilla. Guess what else happened this week? It is time for CAMP LOOPY 2013! I am SUPER EXCITED! 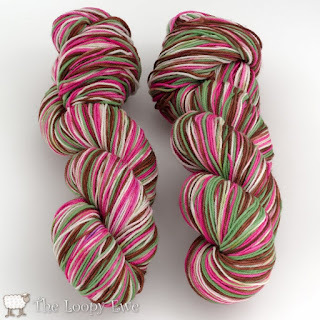 This week is "Camp Loopy Store Week" so I got 20% off some Desert Vista DyeworksViso in Colorway Spumani. This first project challenge is any pattern that uses one skein of yarn at least 375 yards. I have been wanting to write my own pattern for a toe up socks with an afterthought heel. I know there are some patterns out there but they are cuff down. So I think I will just write one up, test knit it myself (along with Darlene) and then I will probably post the pattern here. 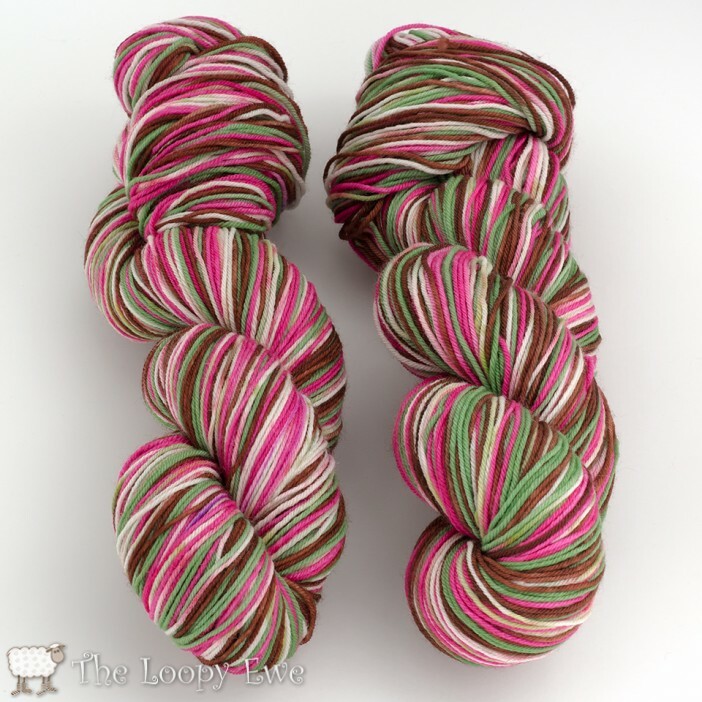 With an Afterthought Heel, I will be able to use up a lot of this awesome self striping yarn (very little going to stash left overs). 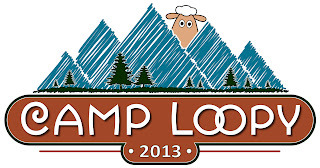 Camp Loopy Here I come!!! I hope to get a lot of knitting done this weekend as Jaime will be going on his bi-annual motorcycle ride on his Harley to New Mexico with a bunch of his buddies. Happy Happy Knitting, and Happy Happy Wednesday! Have a great week!! PS.....Go Spurs Go.....we won game 5 last night (remember, I was up late) and I hope we take game 6 tomorrow night, but I also hope I am not up late enough to watch it! Ridgely is beautiful! Lots of great knitting. Go,girl, go.